Shami kebabs are made with an abundance of fabulous spices, meat (beef, goat, lamb or chicken) and chana dal (dried garbanzo beans). 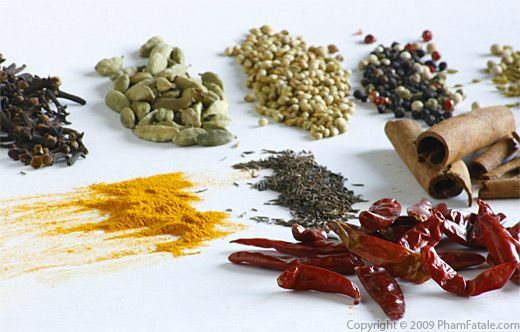 The spices vary depending on whether they're from India (Lucknow or Hyderabad) or Pakistan. My husband Lulu's family is from Hyderabad. They're all meat-eaters, with the exception of my husband and father-in-law. So we often make this dish when we have family over for dinner. These are not your average kebabs. The meat is cubed and cooked in a pressure cooker with chana dal, and once cooked, it's ground in a food processor with yogurt. The resulting mixture is formed into "hamburger" patties that can be frozen or seared, depending on when you plan on eating them. I learned this recipe from Baji, Lulu's late grandmother. She was an excellent cook. When Lulu and I first got married, she was already giving us hints. "Jackie, I'm going to teach you a meat specialty from my hometown. 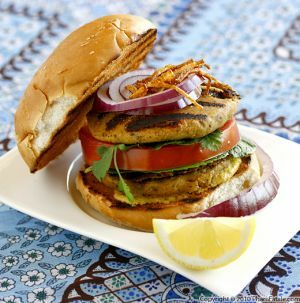 They're called Shami Kebabs; they're spiced hamburger patties. This recipe is a must-have when you two have little children. It's nutritious and easy for little ones to eat. Speaking of which, when are you going to give me great grand-children so I can feed these kebabs to them?" I would always smile, nod and pretend I didn't hear the part about having kids. Don't get me wrong, we'd love to start a family, but the pressure was a little overwhelming. Lulu's grandmother isn't with us anymore, but I promise that I'll make this for my kids when I have them, assuming they don't become vegetarians like Lulu (fingers crossed). 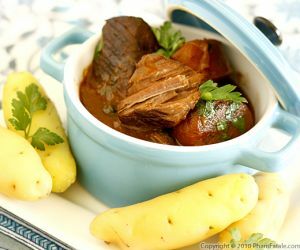 2-½ pounds beef cubes, about 1-½"
Marinating the meat: In a bowl, combine the beef cubes, 2 tablespoons of yogurt, ginger garlic paste, paprika and red chili powder. Marinate the meat for 30 minutes. Prepping the nuts: In a mortar and pestle, grind the 3 nuts (almonds, cashew nuts and peanuts) into a fine paste. Prepping the poppy seeds and cumin seeds: Dry roast the poppy seeds and cumin seeds in a small pan. Allow to cool and finely grind them in a mortar and pestle. Heat 2 tablespoons of canola oil in a pressure cooker (without the lid). Once the oil is hot, sear the beef cubes for about 2 minutes until browned on all sides. Remove from the heat. Add the soaked chana dal, garam masala, jalapeño peppers, bay leaf, 2 tablespoons of mint, 3 tablespoons of cilantro, ghee and 1 cup of water. Carefully seal the pressure cooker with the lid and lock it. Put it on high heat, then start counting the cooking time after it's started to steam. At this point you can turn down the heat, but it has to continue steaming or it's not cooking properly. In any case, follow the instructions for your own pressure cooker (depending on which model you may have). Cook for 13-15 minutes total. Remove from the heat. Let stand for about 10 minutes, removing as much steam as possible. Remove the lid (I had to call my husband Lulu for help). The liquid should have evaporated. Let cool for about 15-20 minutes. Remove and discard the bay leaf pieces. Once cool enough to handle, check for doneness. The chana dal should be soft when it's gently pressed and crushed between your thumb and index finger. Chop the beef cubes into shreds. Lightly oil the bowl of a food processor with a silicone brush. Combine the beef, chana dal, turmeric powder, coconut powder, nut paste, ground cumin and poppy seeds, raw very finely chopped onions, remaining yogurt, 1 tablespoons of chopped mint and lemon juice. Season with 1/2 teaspoon of salt and 1/8 teaspoon of black pepper. Blend until a smooth paste is formed. Add ¼ cup of water for a smoother flow (if necessary). You could also add more yogurt. Checking the seasoning: In a small pan, heat about 1 teaspoon of canola oil. Add about 1 to 2 tablespoons of the beef mixture. Cook for about 3 minutes. Taste the meat. Adjust seasoning with more salt and pepper if necessary. Brush a grill pan with the remaining canola oil. Add the shami kebabs and pan-fry them for about 2-3 minutes until there is a nicely browned crust; flip them and brown the other side as well. Garnish with raw onion rings, lemon (or lime) wedges, fresh mint, fresh julienned ginger, cilantro, fresh green chiles or serve them on a bed of lettuce and chopped tomatoes. Serve hot with basmati rice, spicy red onion chutney (recipe in tip section) and raita (Indian yogurt sauce) on the side. 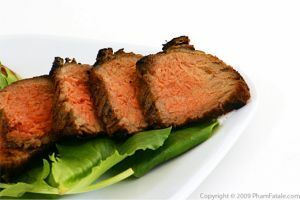 I used rump steak; you don't have to buy expensive, lean cuts of meat. 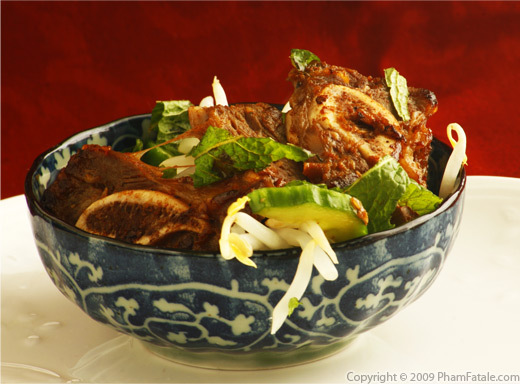 I pre-cooked the meat in a pressure cooker to tenderize the meat and save time as well. 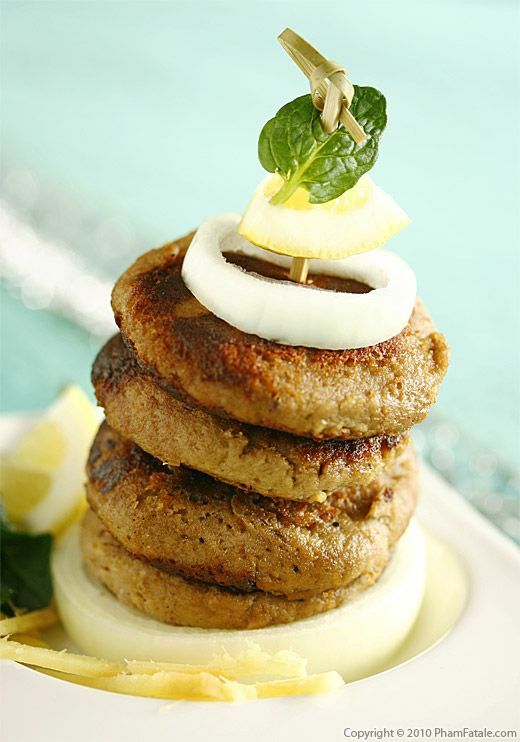 Shami kebabs resemble a hamburger patty, whereas shish (also known as seekh) kebabs are shaped like a hot dog. You can find chana dal (also known as split Bengal gram), dried garbanzo beans or dried chickpeas) at any Indian store. The flatter the onion, the sweeter it is. I always try to pick the flattest-shaped yellow onions at the market. You can add a little sugar, depending on the level of sweetness of the onion. Heat about 1 tablespoon of oil in a non-stick pan. Add thinly sliced onions. Cook over medium-low heat for about 10-15 minutes, stirring frequently to prevent the onion from burning, until the color is evenly golden brown. To save time, I often have already-caramelized onions on hand in the freezer. So I suggest making them in advance in large batches. Just place about 1 tablespoon of tightly packed fried onions per slot in an ice-cube tray and freeze them. Transfer the ice-cubes 3 by 3 into sealable plastic bags and place back in the freezer. I think it's the best way to keep the same flavor without getting freezer burn. I store them exactly the same as I would extra pesto or papaya (for marinating meat). 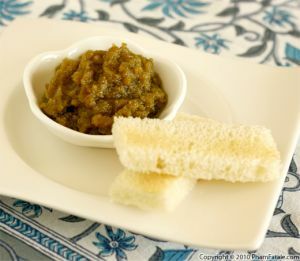 Check out the recipe for red onion chutney (This is one of Lulu's favorite chutneys). You could also store the remaining un-seared shami kebabs in the freezer. Using a tray, chill the kebabs (placing little squares of parchment underneath each patty) for about 1 hour in the freezer. Once hardened, stack the patties with the parchment squares between them to prevent them from sticking to each other. Place the stack in a large resealable bag (remove as much air as possible from the bag). I think it's the best way to keep the flavors without getting freezer burn. The kebabs can be stored up to 1 month in the freezer. Don't forget to label your food with the date! Published By: Jacqueline Pham on February 16, 2010. That picture is mouth-watering! I bet the meat is sooooo flavorful, given all the spices in there! These patties sound amazing! I've never seen "burgers" with so much spice. I think I absolutely have to have them. I love the story about your grandmother-in-law. It's so sweet how quickly she welcomed you into the family with open arms! You gotta love grandmas! The kebabs look wonderful. Wow, thanks for passing along this recipe, it looks very special. I cannot wait to make it. All the spices put together sound amazing and the fact that your husband's grandmother shared it with you makes it even more special.